To tackle a disorder effectively we need a good idea of the true causes. Causes of emotional distress match up with the causes of many other chronic modern disorders. What are the common causes behind all these troubles associated with modern living? Which common causes can I help people eliminate from their lives? Recovery depends on being prepared to change what we eat and drink, whether we smoke and being able to question those who encourage us to take any form of drug. When we can improve the ‘what, when and how’ of what we ingest (and may or may not digest), then healthy activities become easier, we sleep better and we can think more clearly. Clearer thinking allows us to learn more, such that we can deal with other causes of disorder in our lives. Bipolar recovery requires finding out about causes, but first we may need some understanding of the psychiatric bipolar categorisation in use today. Are we all, from time to time, a bit bipolar? Are there as many forms of bipolar as there are people in the world? Bipolar is about categorization rather than diagnosis. Diagnosis means identifying causes, so technically speaking no one can ever be diagnosed as bipolar because bipolar categorization is reserved for people where the cause is not being identified. 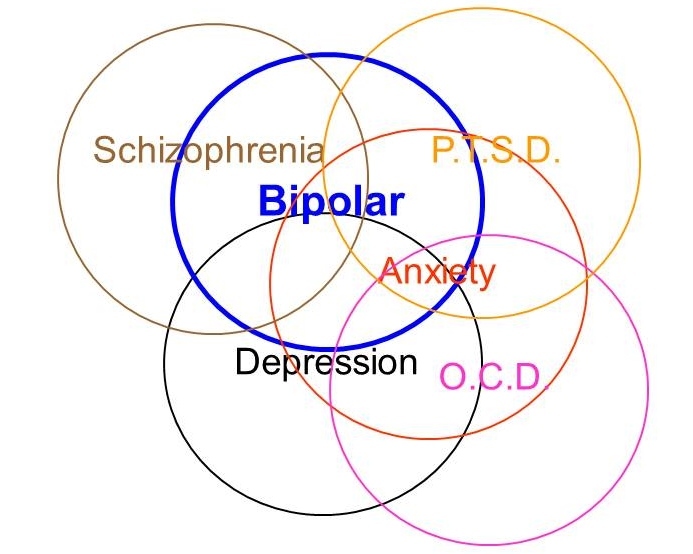 Bipolar categorization is about labeling. 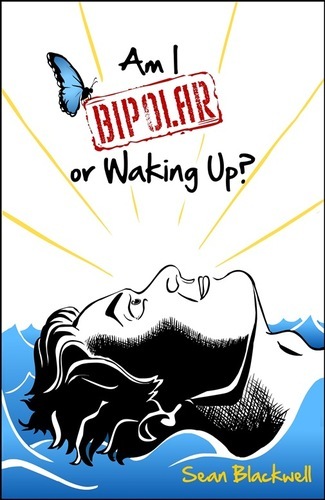 1) Bipolar 1: This is the label given to people who admit to having low energy moods and have been seen to have some extremely high energy moods, whether associated with positive or negative feelings. This is equivalent to the old Manic Depression, other than; the highs in bipolar often being unpleasant with negative feelings or a confusing mix of positive and negative feelings, rather than the traditional manic depressive’s high which was considered to be a kind of ‘happy’ time for the person experiencing it. When the bipolar label first became available to psychiatry in 1980 this was the only type of bipolar. Although the numbers with this label continue to grow it still accounts for less than 2%* of the adult population. 2) Bipolar 2: This relatively new label is probably the fastest growing in the UK and may already have been applied to nearly 10%* of the adult population. It is used for people who admit to having low energy yet have never been seen to have extremely high energy moods. It tends to be given to people who previously would have been described as depressed as well as to people who suffer from fatigue syndromes where mood changes seem to be their main problem. At first a label can help us find support, however, bipolar labels stay on our (UK) health records for life, often preventing professionals from looking for or tackling the causes of our troubles. In many ways the exact label is not so important. The part that needs to be tackled is the cause or causes. Only by getting to grips with what causes us to be seeing a psychiatrist can we start to make a lasting recovery, otherwise we will continue to have to manage/cope with moods we do not want to be having. I am hoping I can help readers to find and tackle the causes of their disordered moods. *In the UK it is difficult to know exactly how many people are affected as many people are not told what is in their medical notes. I would like to hear from anyone who can provide up to date estimates of numbers affected. Around the world, millions of people are being mis-diagnosed without much evidence of extreme manic and depressive episodes. I was told I had manic depression then told I had bipolar. The drugs I was told to take for bipolar helped me feel better for a while then gradually made me less and less well. The drugs eventually became the main cause for my worsening symptoms. To survive I had to take less drugs. Eventually my doctor said I did not need the psychiatric drugs at all. Just a few days of using the Mood Mapping grid is all it takes for most people to realize they are not so bipolar after all. Using mood mapping reminds us that we all experience a range of moods and we find bipolarity is still very rare. There certainly is no clear-cut line between a ‘bipolar person’ and a ‘non-bipolar person’. Everyone has emotions and everyone can struggle with their emotions but while there is a diagnosis of bipolar there will always be people who can accept the label and others who reject the label. I was taking the psychiatric drugs; believing in the bipolar diagnosis, attending bipolar meetings, facilitating a group for people with the bipolar diagnosis and so on. I had extremes of mood and there were plenty of health professionals saying I needed the drugs. Like many other people I have successfully withdrawn from the drugs. It was a slow process taking me 12 years. I have changed my life and increased the ways I have cope with stress to do this. I recognize that a lot of people continue to find drugs a useful tool to help to manage from day-to-day. If; the drugs are helping you feel better, you are happy with your level of fitness and you are fully aware of any long-term drug effects then it is understandable that you want to stick with the drug and diagnosis. If the drugs and diagnosis are not working for you or you find you become troubled by the longer term effects of drugs and diagnosis then it is best not to rule out a change to either/both. There are probably lots of these petitions underway now. I just want re-blog the link to the one Jeff mentioned as the link did not work for everyone first time around. A petition against the use of DSM-5 – interesting – American Psychiatric Association. There have been lots of stories about the long-awaited or long dreaded DSM5. This is the new version of the American Diagnostics Manual that is likely to be used all over the world to match human emotions to psychiatric labels that allow drugs to be dispensed and so keep psychiatry going a bit longer. Is the APA’s latest DSM-5 deliberation a step too far? It would seem the American Psychiatric Associations latest move with DSM-5 is to classify bereavement as depression, or rather, more vaguely, in typical obfuscation, grief will no longer disqualify you from being diagnosed with depression. Has it really come to this? Normal events – which sadly for most of us includes bereavement – are no longer safe from more ‘scary’ diagnoses. You may feel I’m overreacting, but if you find yourself seriously knocked senseless with grief and one weeps a bit too much, for a bit too long, ergo you can be classed as depressed and indeed, mentally ill.
And if you are diagnosed as mentally ill by your physician it can carry all sorts of long-term implications, effectively barring you from many aspect of civil life – like say Jury Service. Does it matter? Well yes it might if you are refused life insurance or medical insurance because of that diagnosis. A casual chat with your Doctor might have significant and negative implications for years after. Remember that in many Western countries Doctors are paid for delivering medical solutions, so don’t be surprised to learn that the ‘medicalisation’ of social matters like bereavement is tempting in the extreme. It’s certainly in the interests of the Pharmaceutical industry to have things presented as medical problems. Bereavement is part of life, as is feeling anxious, hopeless and feeble sometimes. Most work their way through it. There is a marked difference to full-blown depression. No bloody wonder the DSM-5 manual threatens to become thicker than the Hong Kong phone directory. Apologies to those ‘ good Psychiatrists’ out there, and I know there are many, but what I do know too, from my followers and all my social media, is that the profession does not enjoy universal support. In fact a straw poll tells me at least 60 to 70% of those I know, have very little time for the profession. When you look at DSM-5 it’s no wonder. I started this site with the idea in mind that I could persuade everyone that there is no need for a medical diagnosis called, ‘Bipolar Disorder’. I was hoping that I could have the label removed from the front of my medical records such that I could have support and treatment for the troubles I really face, day after day. Unfortunately the bipolar label is very sticky and no matter how many experts I meet with who agree that I do not have bipolar disorder, I cannot be unlabelled at this time. Why do I dislike the label so much? Right at this moment I most dislike being called bipolar because it is such a misleading term. Unless people know what the poles are then bipolar is a rubbish idea. With so many celebrities now accepting the bipolar label we might all hope that things will start to become clearer. Unfortunately this has is not happening. Celebrity experiences of bipolar have little in common with the majority of sufferers. This is not the fault of the celebrities, as I know they struggle too. It is just that when you have plenty of money and support from friends and family it is a lot easier to cope and recover. Most of us with the label struggle to find support or to afford private treatments. Can we simply be exhausted without being labelled as bipolar these days? A lot of the time it feels desperate. I feel about as bad as it is possible to feel and my thinking is not good either… lots of thoughts starting with “Can’t… “. 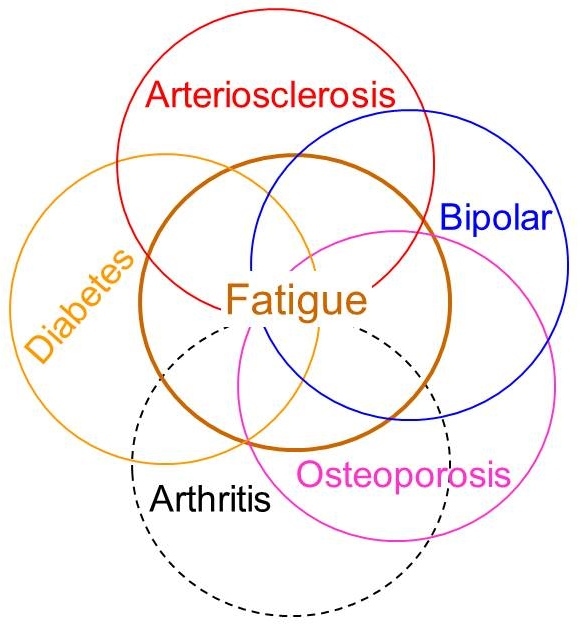 I think the main problem is exhaustion brought on by the prolonged high stress that I have been suffering for years and more intense stressors this year. A few times each day I have enough energy,which helps with getting dress or occasionally driving to the office. Increasingly I do not have enough energy………………… or possible it is that physically I may still have some energy but I do not feel able to do anything. Simple tasks are daunting as again and again I fail to do anything. I wanted to say, ‘fail to complete anything’ but the reality is that mostly I set things up ready to do and then fail to even start before putting whatever it was away again. I know about types of faulty thinking and recognise that I have much faulty thinking. 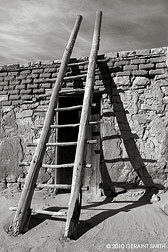 Ideas such as not living past New Year and that I will never again be able to earn any money would appear to be irrational when looking at the facts or basing the future on my past. I have come back from some very bad situations before. The feelings are not unlike those I had when taking psychiatric drugs… slowed down, struggling to think, thick-headedness, wanting to crawl way and hide. That was desperate then as I did not know I could gradually take less or ever manage without the drugs. Now though I can see no way out as I have been through the whole drug thing and remember each one making me feel worse. I am fearful of the psychiatric system where exhaustion is seen as an illness rather than simply exhaustion. I’m not saying whether this post from ‘Bipolar Comic’ Kit Johnson is funny or not – I just think it is an interesting discussion of the idea that there could be far too many people saying they are bipolar without necessarily having had the kind of extreme symptoms normally associated with a bipolar diagnosis. Full recovery means different things to different people. It used to be about returning to the sorts of things you used to do before diagnosis. I was thinking of full recovery as having an expert say that you never had the disorder and having the damaging diagnosis removed. Well, I have met with experts who agree that I was suffering from extreme anxiety and not bipolar. Unfortunately there is still no system in the UK for removing psychiatric labels. Here, Dennis Dodson of Tennessee. explains how he has achieved recovery, not through psychiatry, but by starting with the dictionary! He explains that we were not really diagnosed at all, as diagnosis involves, “investigation or analysis of the cause or nature of a condition, situation, or problem”, and “the art or act of identifying a disease from its signs and symptoms”. I agree. No psychiatrist ever made an effort to find out what was wrong with me or what caused my troubles. So that means I was simply labelled and not diagnosed.